2012 XC: No more updates are being made to this page - goto 2012 XC (link on left). Even TRACK updates will be referenced on the XC page. SJ Mercury: Track & Field Athletes of the Year. SJ Mercury: Furtures look bright for Floreal & Jaques. Mitty HS: "Men's Assistant Coach at Archbishop Mitty High School". Interested parties should contact me: Dan Hodgin; Dan@danhodgin.com 408-550-6326. The position is a paid position. 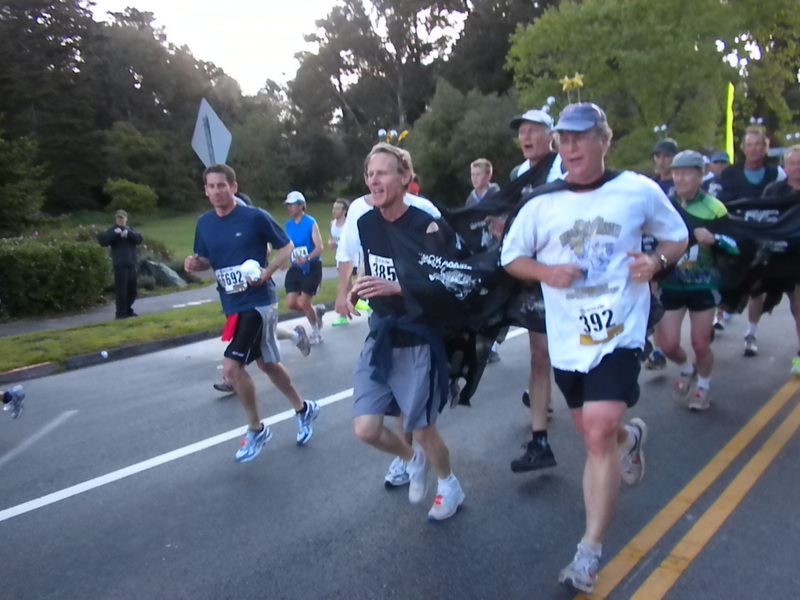 Sarah Stapp: Gunn High School in Palo Alto is looking for a head cross country coach for the 2012 season. If interested, please contact Sarah Stapp at sstapp@pausd.org. Sacred Heart Prep: in Atherton is looking for an assistant XC coach, if interested please contact Marisa Beck at mbeck@shschools.org. SJ Mercury: State Meet preview. Trials Review. Finals wrap-up. CCS Preview: Thanks to Darrin Garcia - enjoy the read. CCS Prediction Contest: from XCExpress. 2007 7th Grade Girls: Middle School Fianls at Westmont HS. I can name 3 of these 7 girls. Run To the Bulls 5K: Was held at Gunn HS this Mother's Day morning and helps support the Track/XC teams (awesome volunteers). San Jose State: Hires Ron Davis to Coach XC & Track. Bay To Breakers: is coming up, which means some serious Centipede action. St Francis Vs Bells/Pres: "Senior Day" for St Francis athletes. EJ Floreal (Palo Alto): he ran a wind-aided 10.52 to break the School Record and to take over the lead as the CCS 100 favorite (#8 All-Time CCS) and then came back with a 21.65 clocking in the 200 to miss the SR by .04 seconds. Performance Psychology: Dr Steve Potenga is in town for Payton Jordan and will speak at Monta Vista HS on May 1st at 6:30, all are welcome. CCS Team Predictions: If CCS were run today and everyone matched their season best and ran in all the events that they are currently listed in, this is how the Team Standings would shake out. Guys have stayed pretty much the same since 3 weeks ago but the ladies have changed up quite a bit. 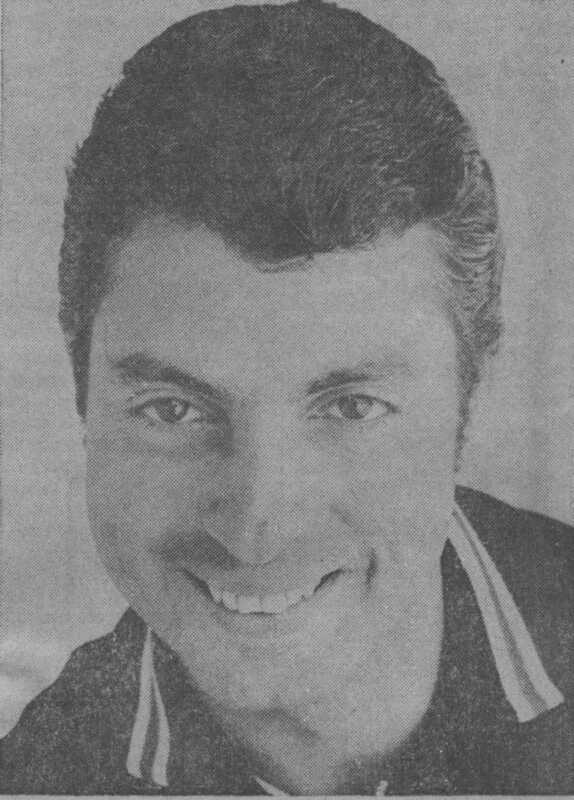 Bill Daskarolis (Aragon): In 1968. Boston Marathon: It was a hot one and hence a slow one. Hoops & Hurdles: a look back by Edward Griffin to 1955 when University of San Francisco was going to bring back their Track & Field program (like San Jose State is planning to do next year). A young Bill Russell who was powerfull on the boards was bringing his athleticism to the oval - a fun read with some great pics and history. 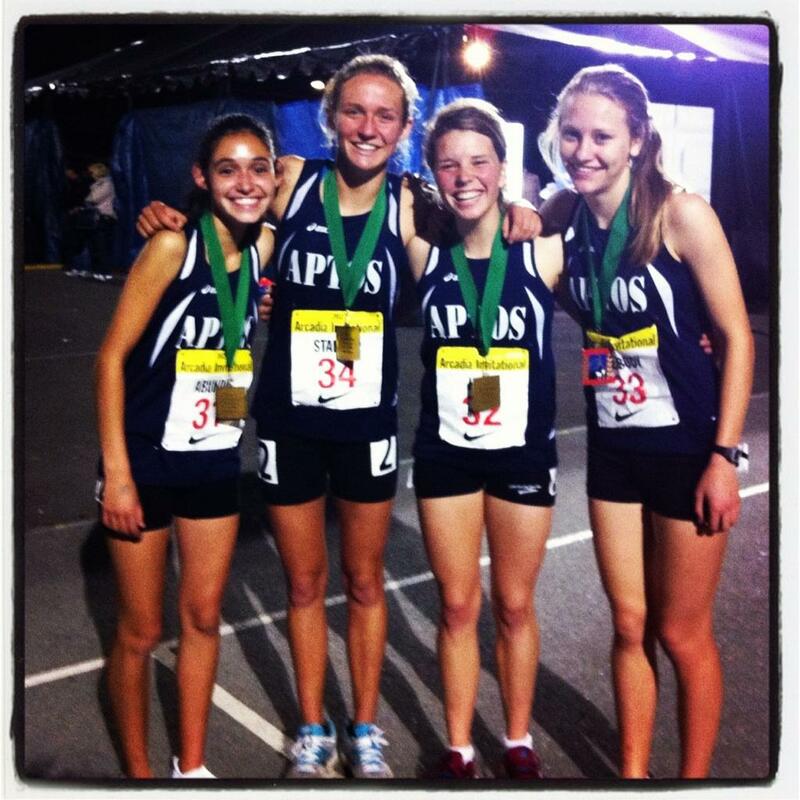 CCS Record for Aptos girls in the 4x1600: A new CCS record in the 4x1600 (old rec=SLV 2000 20:48.41) was set by Aptos (20:45.43) at Arcadia with a team of Clare Peabody (5:10); Jackie Stanger (5:16); Yulisa Abundis (5:18); Nikki Hiltz (4:58.5). Lynbrook Vs Paly Meet Records: Last dual meet of the season coming up this thursday at Palo Alto. I predict the Vikings will win all 4 divisions. Boston Marathon, 1st Woman: With Boston coming up in a week, here's a great look-back to 1967 when the first woman "crashed" this all-male event - a good watch. CCS Top 8: Coaches - I am in the process of verifying all marks for the CCS Top 8 meet. Please use ONLY marks from THIS YEAR when making your entries. Lynbrook Vs Saratoga: Vikings come away with 3 out of 4 wins, just the JV Girls escapes them. Millard Hampton: Alex Aguilar and coaches Poynter & Gibeau. Lynbrook Vs Saratoga Meet Records: The Vikes havn't gone up against the Falcons since 2009 - that all changes on Thursday. 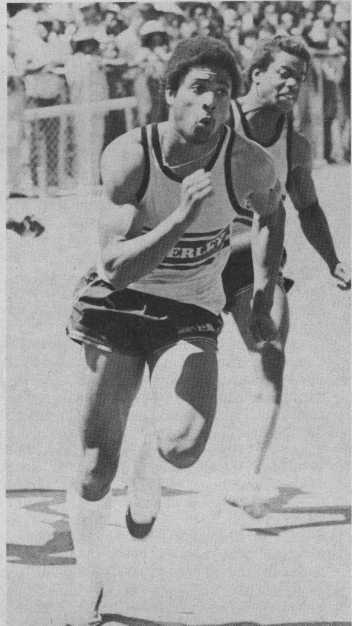 Bill Green ('79-Cubberley): who is #2 on the CCS All-Time 400 list passed away at the age of 50 of esophageal cancer. Palo Alto Online story about Bill. Wildcat 5K: Dougherty Valley HS (San Ramon) puts on their annual track fundraiser 5K. Lynbrook Vs Mt View Results: Still missing the Shot Put results (hopefully they're drying out somewhere) but it's pretty clear what the final results are... Mt View wins the VB & VG while Lynbrook takes the FSB & JVG. Results are now complete. Lynbrook Vs Mt View Meet Records: Tuesday is the day, hope we stay dry. Jim Ryun: Ever wonder what kind of workouts a 16 yr old (Junior) Jim Ryun (first HSer to break 4:00 in the mile) did in order to go sub-4? Month 1 / Month 2 / Month 3 / Month 4 / Month 5 / . West Valley Relays: LynbrookSports.com will be at the West Valley Relays this weekend tweeting results and progress to the schedule. Since it's a "rolling schedule", you really should "follow" me so that you have some sort of idea where we are in the meet. Lynbrook Vs Milpitas Meet Records: Off to Milpitas HS for this weeks dual meet. Eric @ 650 949-6906: De Anza is surplussing their Pole Vault and High Jump pits right now. If anyone is interested in some cheap equipment they can contact Eric 650-949-6906 at the Foothill-De Anza purchasing office to inquire on how to purchase this equipment. Both pits are still fully functional. The High Jump pit is in pretty good shape especially. I am imagining these will be sold for a 200-400 dollars a piece if anyone is interested. 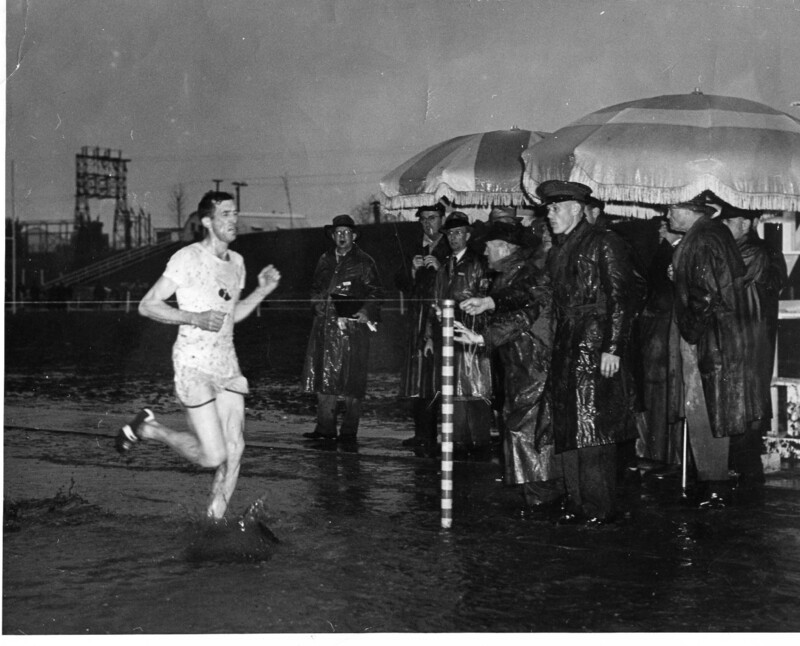 Ahhh, the rain -: How would you like to be Horace Ashenfelter (or the officials) above, but I'm sure he was used to getting wet, being a steepler. Or these poor (pour) souls at Hampton/Phillips? St Francis Invite: LynbrookSports.com (meaning me) will be at St Francis Invite this weekend tweeting results and progress to the time schedule (ahead or behind) & results. If interested, then "follow" me (LynbrookSports that is) on twitter. Lynbrook Vs Gunn Meet Records: Back to my alma mater to take on the Titans - Go Vikings! (now that just feels odd...). Darryl Beardall ('55-Santa Rosa HS): So let's say you started running at age 15 and ran 20 miles a day, 5 days a week (100mpw) and you ran 50 weeks a year (5000mpy), in 60 years (age 75) you'd achieve what Darryl has achieved, over 300K of miles. 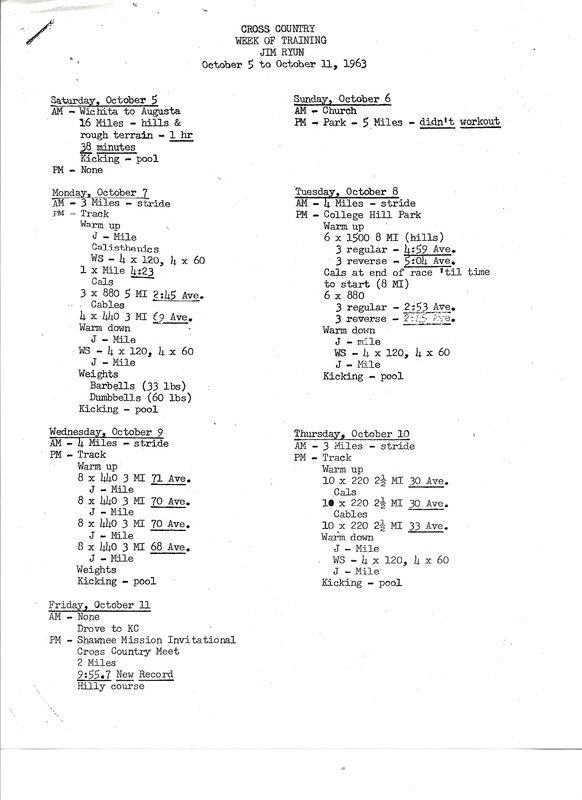 His best HS finish I could find was the 1954 NCS XC Finals where he placed 3rd and he's still racing some 60 years later. K-Bell Invite: LynbrookSports.com (meaning me) will be at K-Bell this weekend tweeting results and progress to the time schedule (ahead or behind). If interested, then "follow" me (LynbrookSports that is) on twitter. Lynbrook Top-20 Lists: So you want to get on the Lynbrook All-Time list??? How fast do you have to run or how far do you have to jump or throw? Check out The Standards here. Lynbrook Vs Los Altos Meet Records: First dual of the season happens this Thursday at Los Altos. 1966 State Mile: Cool video of Tim Danielson (Chula Vista), who is one of five HS'ers that has broken 4 minutes in the mile, winning States at Berkeley. Note the 2-turn stagger start. 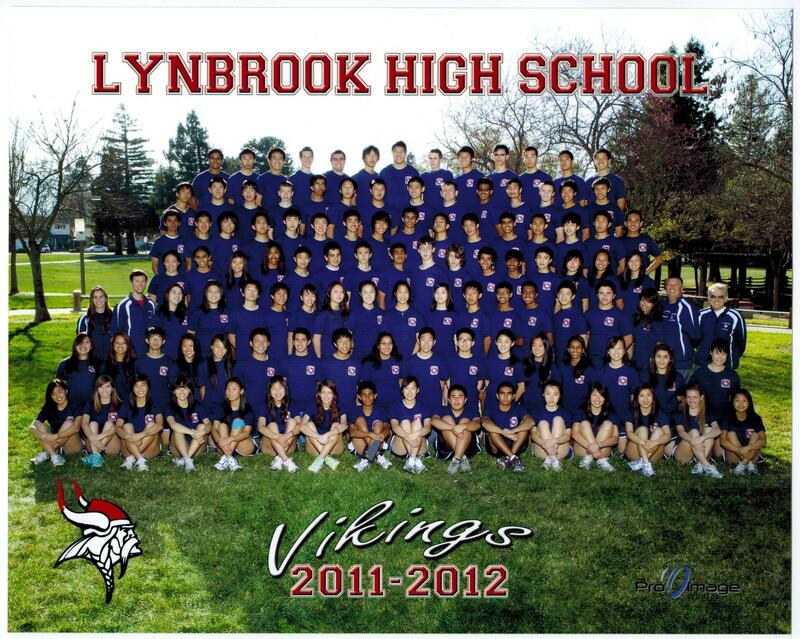 Tobias McLeod: Branham HS is looking for a FinishLynx timer to time/score their Quad Meet on March 15th. If you are interested/available, contact Tobias (on the left). Brooks PR: Check out which CCS athletes will be competeing in Seattle on Feb 26th. RESULTS: Bishop 9:07.88, Hiltz 4:50.55, Sturges 4:53.87 - whew. All Results of LGAC's: The Los Gatos Winter All-Comer Meets. Results 02-25. 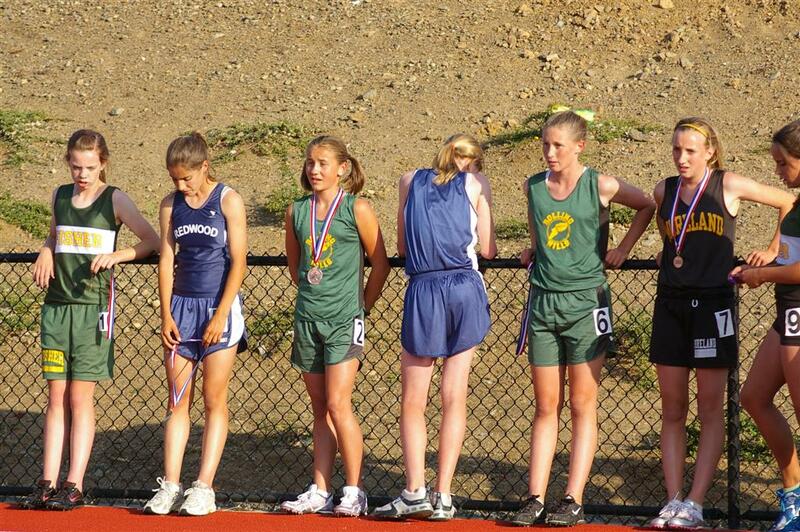 And the 8th and Final All Comer meet from last summer. Meet Pictures Here. Simplot: Sean Davis (Valley Christian) #1897 bringing it home for the win at Simplot with a 1:53.7 800 split. LA84Foundation: February 19 - Beginning Level-Corona High School, February 26 - Beginning Level-Moorpark High School, click here for the agenda. Campbell Valentines Race: Results for both the 5K & 10K with 1130 reg'd runners and 1040 finishers. Bring Back The Mile: Would it be possible to get the Mile back and toss the 1600? There is a Grass Roots effort to do just that. 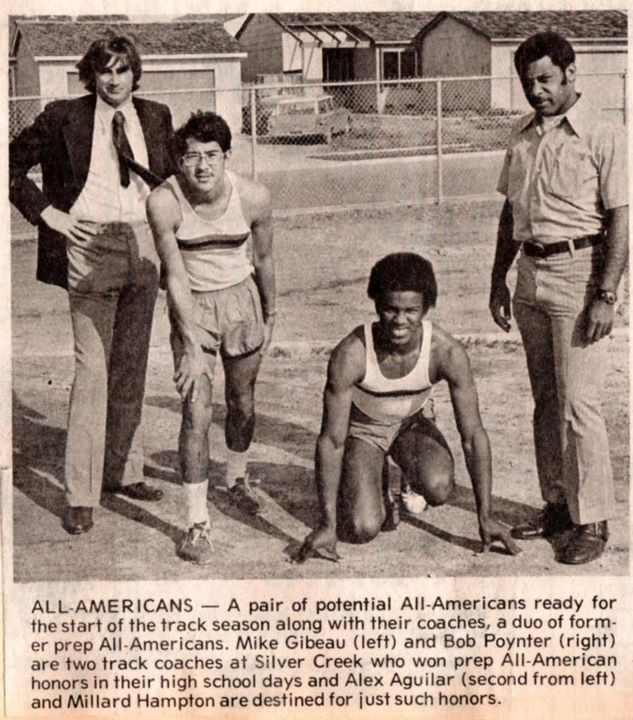 1977 San Jose Relays: at SJCC. Mile - Stillman, Ross & Barry with a 4:11.54 winning time. XCStats: has updated their Track & Field application for 2012. The system includes performance reports and graphs, email system, goal setting, training logs and text messaging. A key new feature is the ability to copy and paste results from web pages directly into the system. Special pricing of $50 for new subscribers. More information is available here or write Mike Sherwood at mike@xcstats.com. Jeff Trout: Mountain View has a stipend position available for BOTH a jumps coach and sprint coach (new) for the 2012 season, phone number - 530-305-6602. High Jump Clinic: I am seeing if there are interested High Jumpers for a private camp (coaches free) with Olympic Medal winning & former world record holder Dwight Stones up here in the Bay Area.We have four so far, three from Paly,Gunn & HMB HS schools. It is open to age-groupers as well. The camp would be Sat Feb 18 at Los Gatos during the All-Comer's meet & Sunday Feb 19 in Palo Alto (either Gunn or Paly). This is over President's Day weekend, rain or shine. Can contact Dwight directly if any Qs. It would be the Gold Package on his website: http://dwightstones.com/the-camp/trainingprograms/ Please let me know via email by Fri Feb 3. Amol Saxena, DPMDept. of Sports Medicine, Clark Bldg., 3rd Flr795 El Camino RealPalo Alto, CA 94301650 853 2943 VMail 650 853 2927 . NFHS T&F 2012 Rules: some new ones and a new rule about Jewelry DQ. Also a clarification from Hal Harkness - on page 4 of the 2012 Case Book, 5.10.7 it says "touching the baton outside the zone is not a violation".... Hal emphasized that this is a violation, as rule 5.10.7 states. Touching the baton before the zone is a violation. A nice, short recap of rule changes for 2012. CCS Time Schedule: This is just a draft and subject to change. From Steve Filios of CCS... "After consulting with the State Meet director Brian Weaver, I have attached a draft schedule (link on left) of the CCS semifinals and finals based on the State Meet order of events. Some noteworthy items: � As anticipated the GLJ, GHJ and BTJ will be conducted first this year, � The Girls and Boys PV will be contested at the same time in the trials. In the CIF finals the GPV will be contested first., � They are no longer alternating the order of racing (B/G). The girls heats will always precede the boys heats., � I reviewed and figured out what was meant by 4-4-4 instead of 3-3-6 in the 1600 races. At the CIF trials there are TWO heats of 1600 for each gender. Previously the top three from each heat plus the next fastest 6 times would advance to the finals. Beginning in 2012, the top four from each heat and the next fastest 4 times will advance to the finals. The CCS meet will NOT reflect this policy since our bylaws call for 2-2-8 qualifying. We cannot change this for 2012 but can explore it, if you wish, for future years at the Evaluation Meeting in June. , � Use of alleys in the 1600 and 3200, Brian confirmed that the fastest athlete will be on the outside in the outer alley. He also recommended that if there were 16 athletes in the race, he would put the slowest 10 on the inside alley (slowest time along the curb) with the fastest 6 in the outside lane (fastest qualifier on the outside)." League entries to CCS: On the Boys side, SCVAL picked up an extra entry (now 6) whereas WCAL lost one (now 2) based on enrollment. Girls are unchanged. 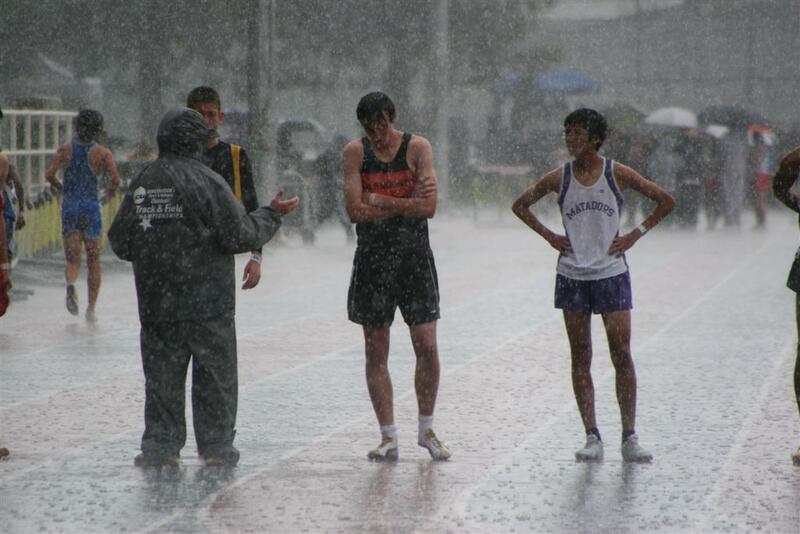 Matt Lai: Woodside Priory is looking for throws, jumps, and hurdles coaches for the upcoming track season. It�s fine if you can only make it a couple times a week. Stipends are available. Please contact Matthew Lai at mlai@prioryca.org or 650-851-6170. Bridget Hall: Milpitas also needs a throws coach and we have a stipend. Email: bhall@musd.org Phone: 408-635-2800 x. 4091. Julie L'Heureux: SANTA CLARA HS: has a stipend position opened for a throws coach for the 2012 track season. Interested people please contact Julie L'Heureux at jolheureux@aol.com or 408-247-9779. Steve Kemp (Mt View): Resigns as Head Track & Field coach. Los Altos Town Crier story. Hank Lawson: Who would be interested in a FinishLynx and HyTek MeetManager clinic? What timeframe would you like (date) and what topics would you like to cover? Email me now and I'll put one on if there is enough interest. LA84Foundation: Are have four clinics on January 14 � Beginning/Intermediate Level � Paramount High School, January 28 - Advanced Level-Mt. SAC College, February 19 - Beginning Level-Corona High School, February 26 - Beginning Level-Moorpark High School, click on the left for more info. VS Athletics Clinic: Jan 21st at Sacramento JC. Lynbrook Alumni Run: Eleven folks made it out this year on a beautiful morning. The Christmas Song: To get you into the Christmas spirit (if you're an animal rights activist you might want to just skip this song). Lee Evans (Overfelt/SJSU "Speed City"): to undergo surgery for brain tumor. 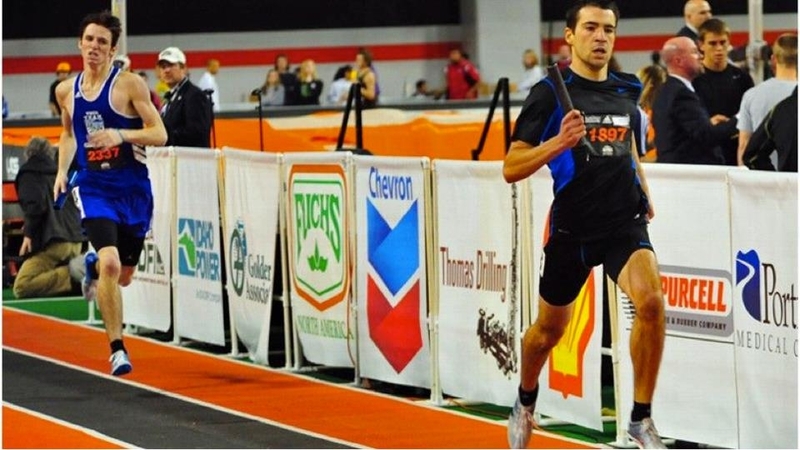 Mitty HS: is looking for a Pole Vault Coach for the 2012 Track season. Practice from 3:00-4:30 M-F starting in February. Stipend available. Please contact Dina Oakland at doakland@mitty.com. St Ignatius: is looking for a High Jump and Hurdle Coaches. If interested please contact Rob Hickox at rhickox@siprep.org or at 415 519-4753. Vintage Track Club: will resume this Monday (Dec 19) at Gilroy High School. The club is open to athletes in the Santa Clara and Monterey Counties.Practice times varies per coach. Athlete ranges from ages 13-18. For more info contact Jeff Myers at 408-807-1694 or email at vintagetrackclub@comcast.net The cost is $75.00. All-CCS XC Teams: As chosen by a panel of XC Coaches. 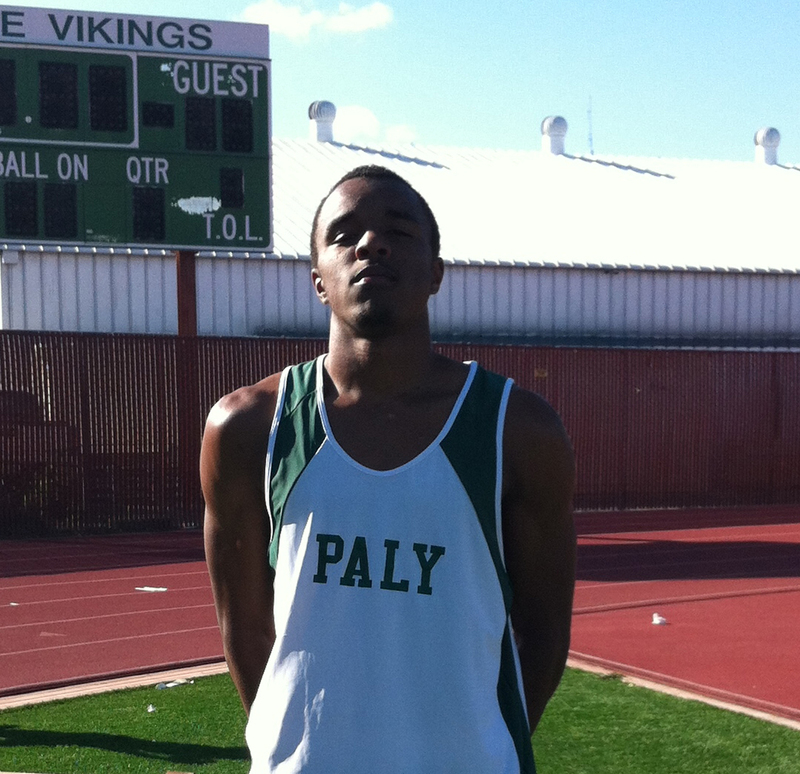 Craig Benson: Mercy High School, San Francisco is looking for track and field coaches for the Spring 2012 season. Stipend available. Please contact head coach Craig Benson at coachbenson@mercytrackandfield.com.